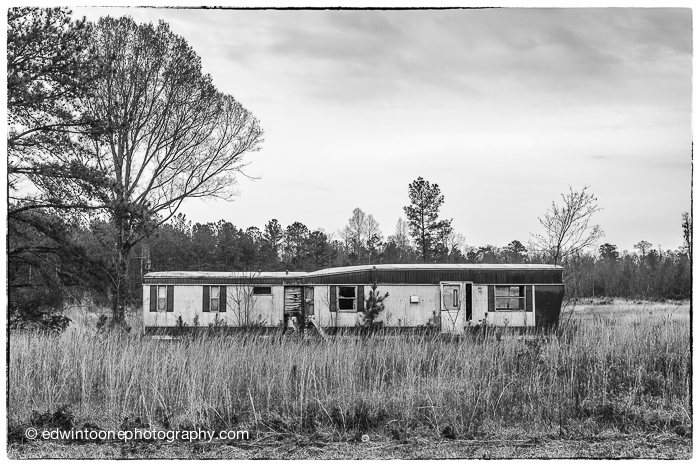 When I see an old abandoned mobile home like this, I have to wonder about who lived here, was this land and home a dream come true or stepping stone to bigger and better things. It is kind of sad and depressing but at the same time promising. State Road 50 is nothing special, it is a combination of beautiful old farms and mobile homes. But, if you had some land there you could really enjoy the quiet old south. A place that can be lonely but at the same time a place where you feel connected. More often than not a mobile home becomes a permanent residence but maybe it’s owners saw it as an in-between place, a place with a roof on land that they own, a place for a future dream house. For if truth be told how permanent is a mobile home?